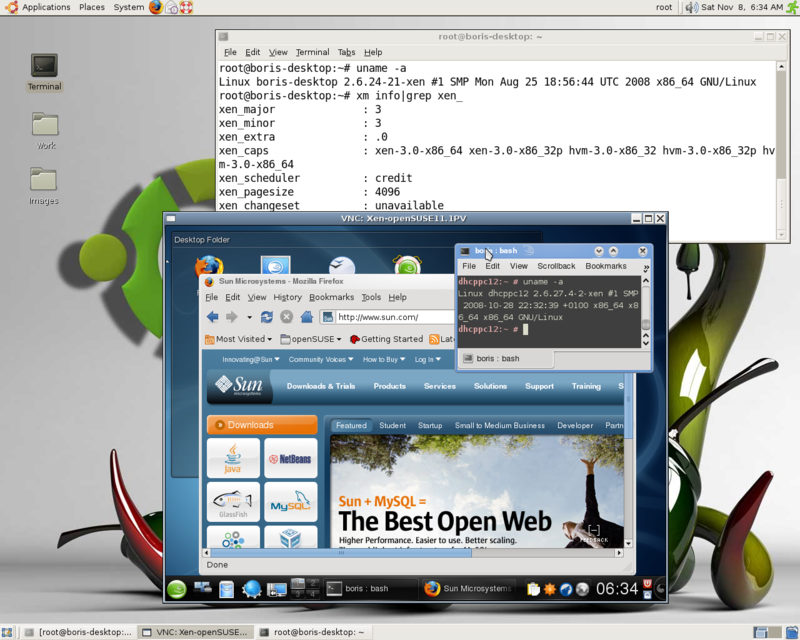 at Xen 3.3.1 openSUSE 11.1 RC1 Dom0. CentOS 5.2 ,F9,F10 PV DomUs have been successfully installed via profiles mentioned at link above. 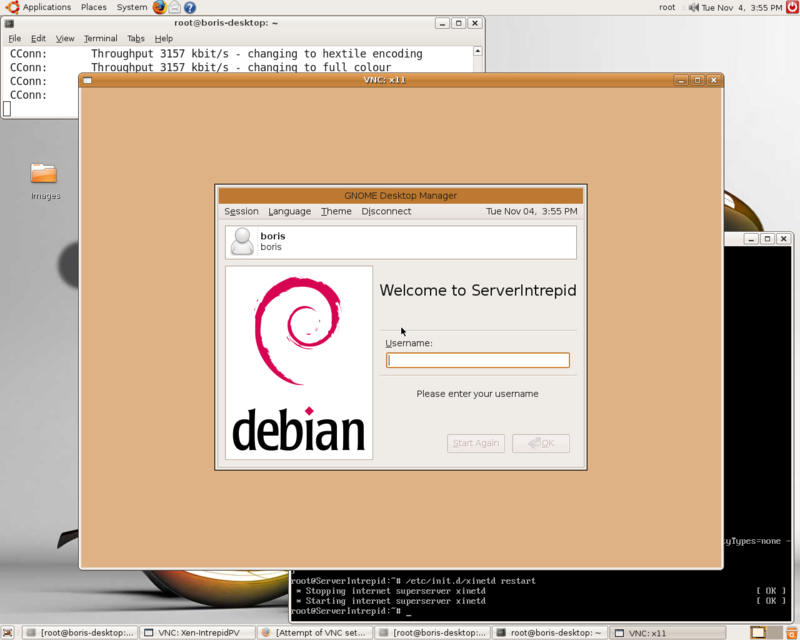 Ubuntu Intrepid Server PV DomU has been installed as usual utilizing image created by HVM Intrepid Server install. http://gitco.de, upgrading only hypervisor to keep virt-install alive at Dom0, brought me to idea just go through traditional “hg” cloning mercurial repository at http://bits.xensource.com and build local Xen 3.3.1rc1 with 2.6.18.8-xen kernel. 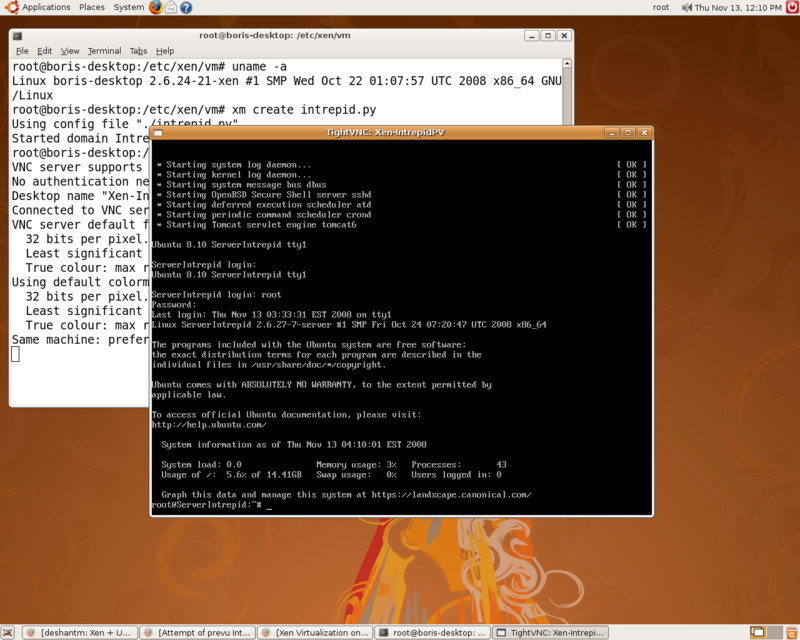 Actually, technology based on utilizing local Apache Mirrors along with pygrub profile,referencing installation versions of kernel ( either xenified or supporting pv_ops) and corresponding ramdisk, to create bootable PV DomU image followed by switching to another standard pygrub profile to load DomU with image, been already created, is flexible enough to cancel urgent need in virt-install. 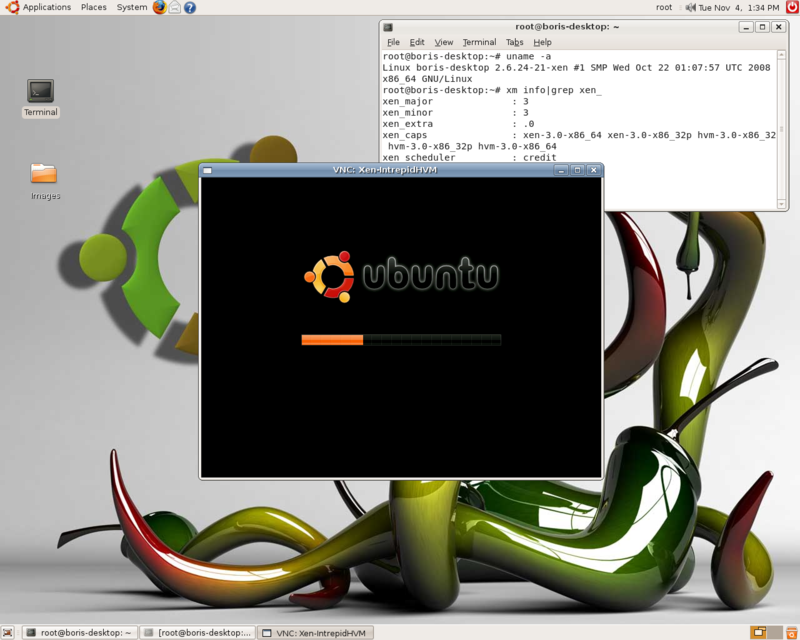 Installation PV DomUs for Ubuntu and Debian doesn’t need virt-install as well. Stub domains also work much more smoothly at Xen 3.3.1rc1-pre port to CentOS 5.2 mentioned in the header. 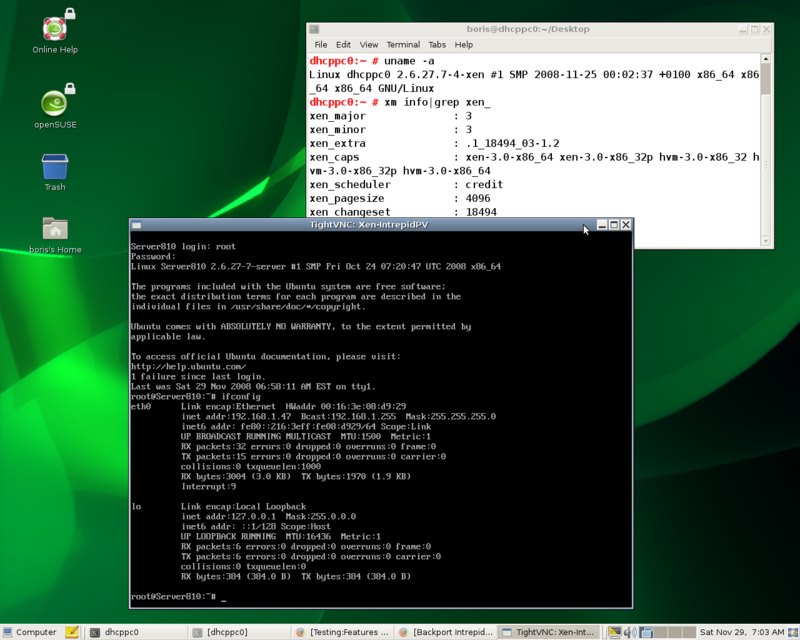 In particular, i was able to install CentOS 5.2 in stubdom pretty fast and without any problems. I’ve tested CentOS 5.2 install as PV DomU and as stub domain (view , for details) ,F9 PV DomU and openSUSE 11 install as PV DomU (view  for details). All mentioned above PV DomUs would be built up with graphical interface straight away. 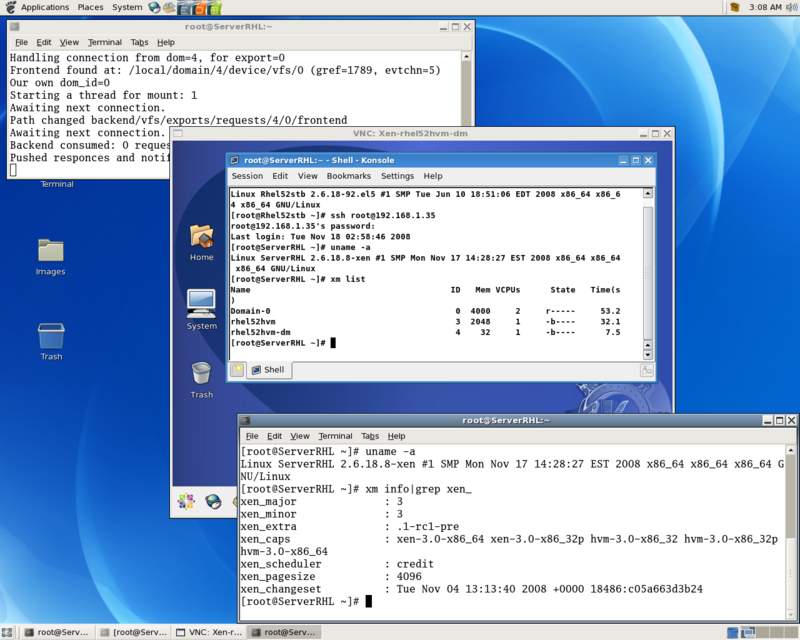 To port Xen 3.3.1rc1-pre to xen disabled CentOS 5.2 instance (64 bit) install the most recent version of gitco and mercurial (hg). to make the required changes for Xen and reboot into new kernel. to create and run stubdom , requiring 2 GB memory. 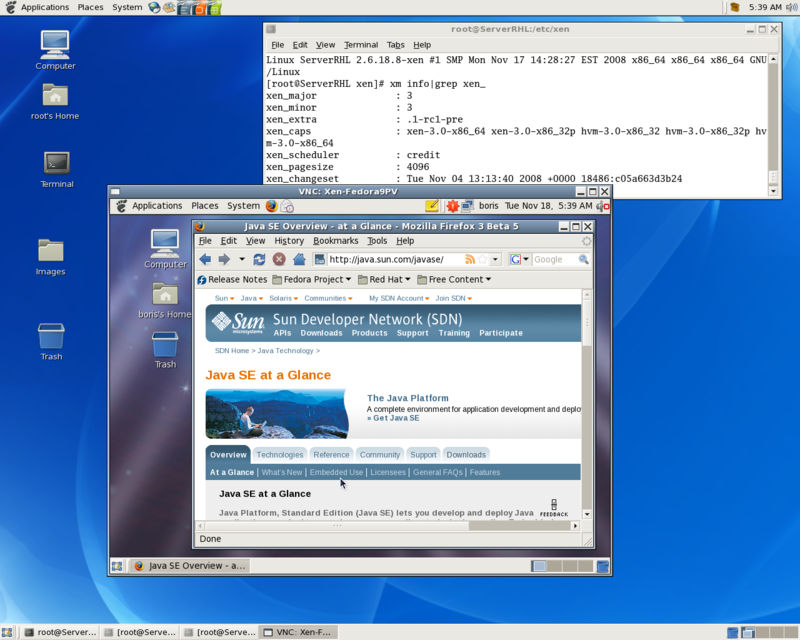 Same install at Xen 3.3.1rc1 (port via http://gitco.de) CentOS 5.2 Dom0 will prompt for either HTTP mirror or NFS shared directory with loop mounted ISO image. 1.To create loadable Fedora 10 PV image we would have to manage at Xen 3.3 CentOS 5.2 Dom0 either multibooting with Hardy Dom0 or remote , then several “dd” conversions might be required due to “scp” step. 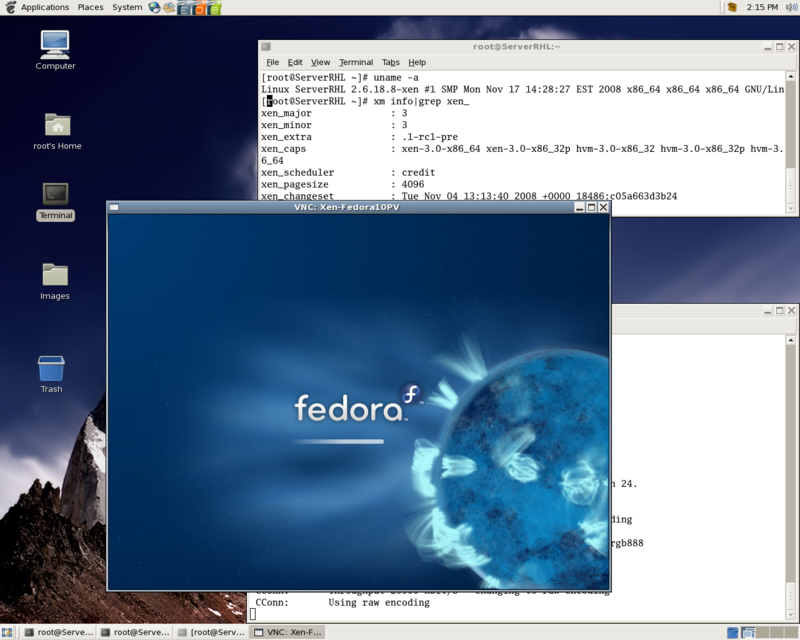 To install Fedora 10 PV DomU local NFS share will be utilized. Local Apache Server simulating HTTP mirror may be used as well. Installer provides both options. Attempts to perform install on Ubuntu Hardy Dom0 failed. Looks like Hardy has problems with the most recent Fedora’s file system. 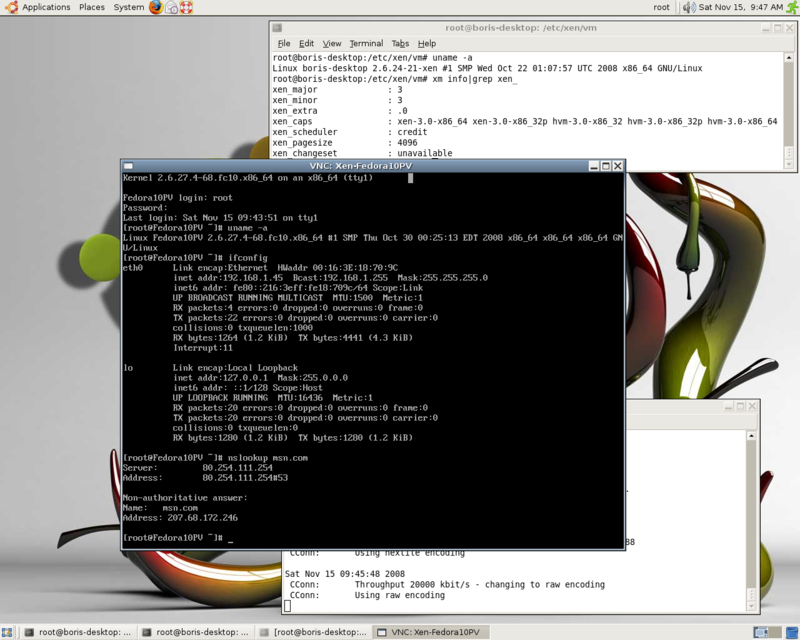 ISO image mounted via losetup doesn’t work correct versus it happens on CentOS 5.2. 2. Another approach may be to install F10 HVM DomU at Xen 3.3 Hardy Dom0 and proceed exactly the same way as in case of Ubuntu Intrepid Server. 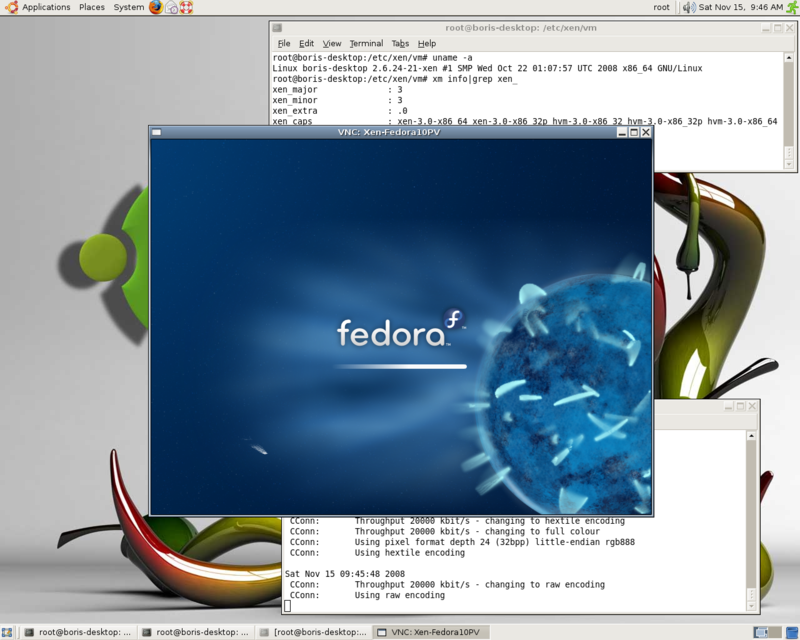 Installed image would have kernel ready to support pv_ops and provide opportunity to load created image via pygrub, e.g. the way to go seems to be an exact reproducing schema been utilized to for Ubuntu Intrepid Server PV DomU install. However, testing second option i’ve got following error at PV DomU boot up. As of November 11 Intrepid Xen 3.3 Hypervisor may be back ported to Hardy Dom0 via repositories. When done activate backports in /etc/apt/sources.list and load Synaptic Manager. and accept suggested conflict resolution. failure install Beta 4 in Dom0 (bug submitted) names of xenified kernel and ramdisk are unknown up on image creation, even though it doesn’t cause any problem in case Xen 3.3 Hypervisor back ported from Intrepid Release. Setup Apache at Ubuntu Hardy Dom0. This is potentially a more time consuming backport but with Xen 3.3 being a huge improvement over 3.2 it would definitely help Ubuntu server market share to have Xen 3.3 available in Ubuntu 8.04. Many server operators will want Xen 3.3 but will want to continue running the LTS release rather than upgrade to Intrepid. Because xen-3.3 is a new package for Hardy and so it needs a manual review by the archive admins. This is normal. shows the status. It won’t be available until it no longer says ‘NEW’ in the builds section. Proceed with “prevu” build to evaluate Intrepid Xen 3.3 Hypervisor at Hardy Dom0. dpkg-deb: building package `xen-hypervisor-3.3' in `../xen-hypervisor-3.3_3.3.0-1ubuntu7~hardy1~8.04prevu1_amd64.deb'. 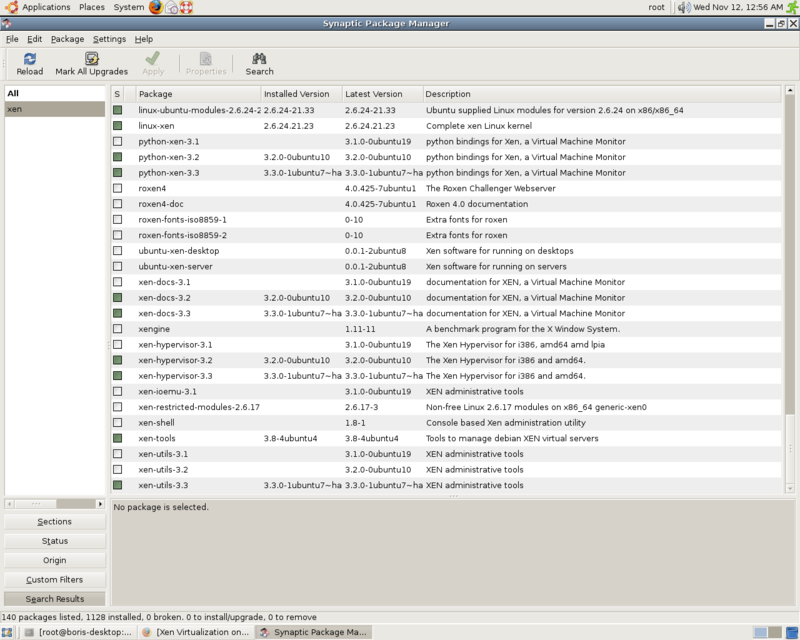 dpkg-deb: building package `xen-utils-3.3' in `../xen-utils-3.3_3.3.0-1ubuntu7~hardy1~8.04prevu1_amd64.deb'. dpkg-deb: building package `xen-docs-3.3' in `../xen-docs-3.3_3.3.0-1ubuntu7~hardy1~8.04prevu1_amd64.deb'. 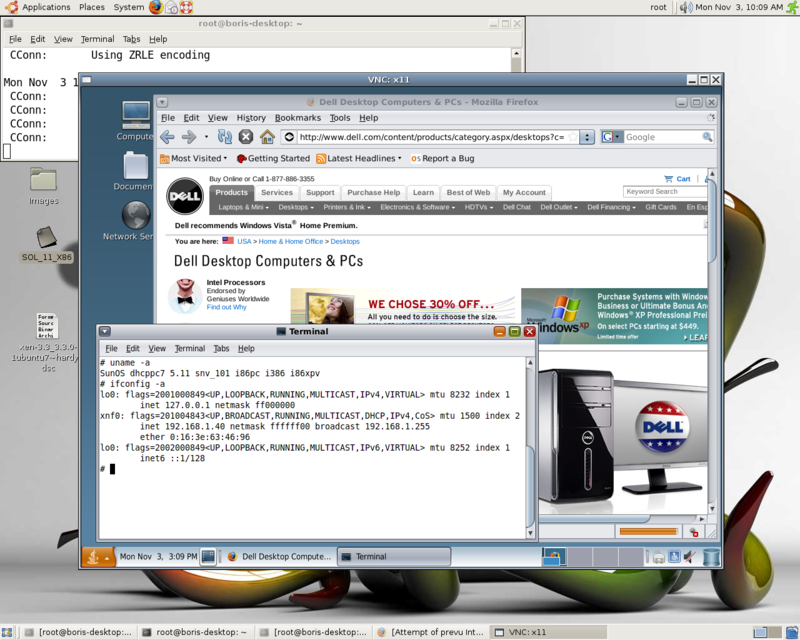 dpkg-deb: building package `libxen3-dev' in `../libxen3-dev_3.3.0-1ubuntu7~hardy1~8.04prevu1_amd64.deb'. 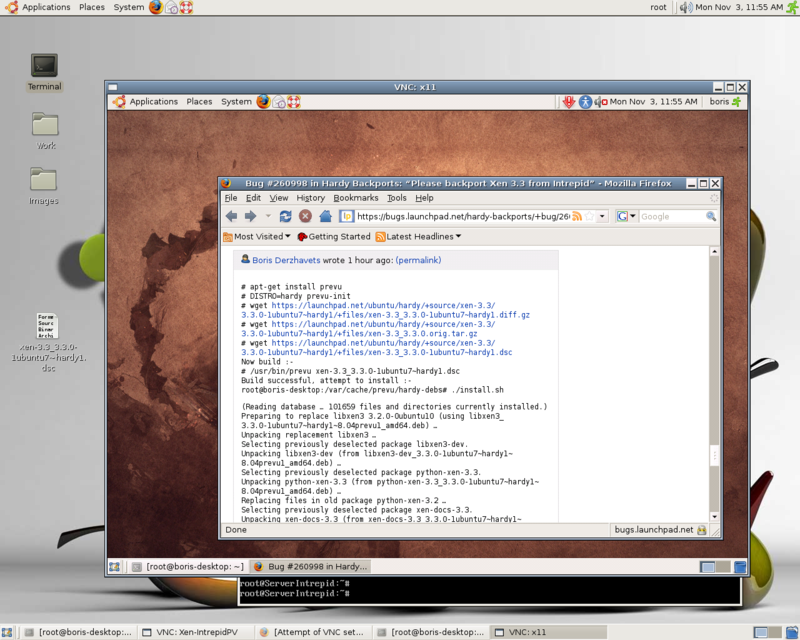 dpkg-deb: building package `libxen3' in `../libxen3_3.3.0-1ubuntu7~hardy1~8.04prevu1_amd64.deb'. 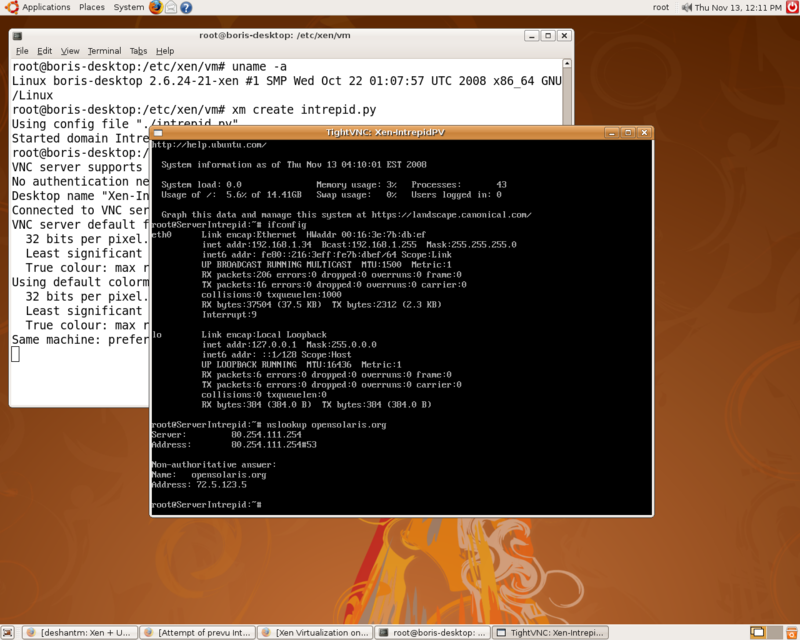 dpkg-deb: building package `python-xen-3.3' in `../python-xen-3.3_3.3.0-1ubuntu7~hardy1~8.04prevu1_amd64.deb'. Selecting previously deselected package libxen3-dev. Selecting previously deselected package python-xen-3.3. Selecting previously deselected package xen-docs-3.3. Selecting previously deselected package xen-hypervisor-3.3. Selecting previously deselected package xen-utils-3.3. 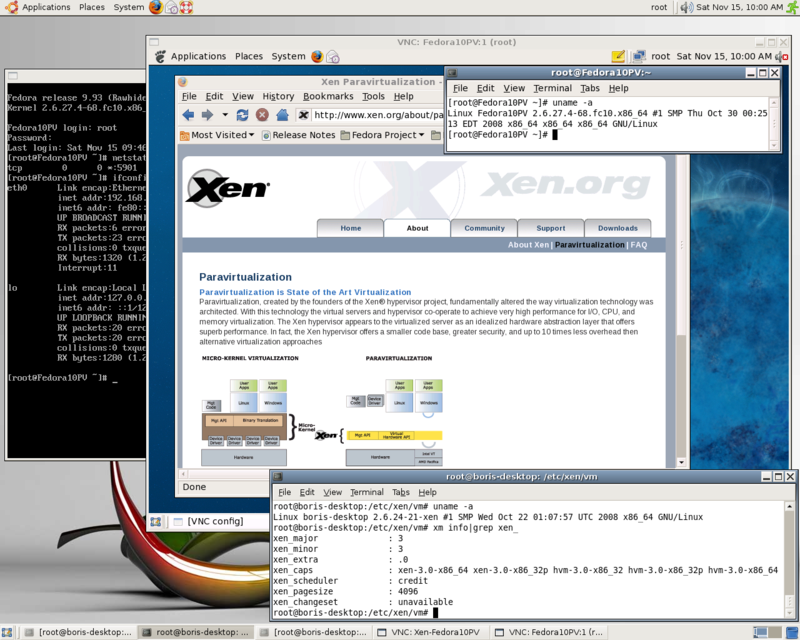 xen-utils-3.2 provides xen-utils and is installed. dpkg: warning – ignoring conflict, may proceed anyway ! xen-utils-3.3 provides xen-utils and is to be installed. Turning virtual NIC into a paravirtualized mode instead of a fully virtualized. When vif=[‘type=ioemu,bridge=eth0’] HVM fails to bring up virtual network interface. image device via tasksel’s procedure. Now we can also load Intrepid Server HVM DomU with PV driver for virtual NIC. Please be advised , as of November 11 Hardy Backports provide Xen 3.3 packages . They may be installed nicely via Synaptic Manager. 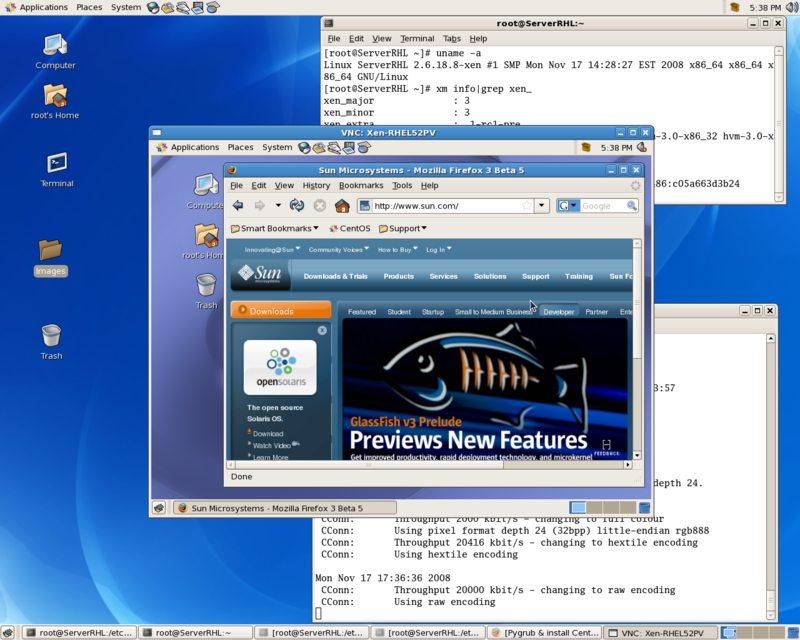 You are currently browsing the Xen Virtualization on Linux and Solaris blog archives for November, 2008.